Ever have trouble getting bread to rise? I sure do. When I really want to guarantee good bread, I hand the job off to my teenage daughter. She has a great touch with yeast bread and almost always gets good results. However, I’ve been reading that pre-soaked and cooked grains are better digested by the body. 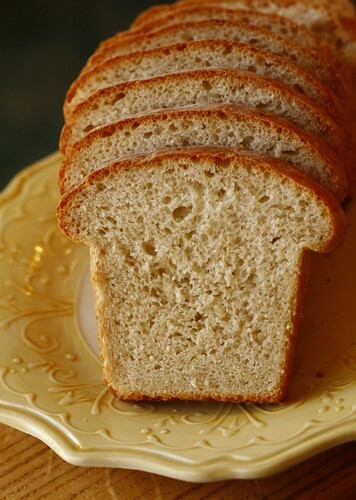 In the midst of that reading I came across the idea of making bread using already-cooked grains. Since I happened to have some leftover oatmeal cooling on the counter, I just had to give it a shot. Here’s the recipe I tried, and I couldn’t be more happy with the way it turned out. It rose beautifully, even for bread-challenged me. It used up a leftover that otherwise would have just gone to our chickens. And it tasted wonderful. One note: the dough may feel slightly sticky even after you’ve added all the flour. To avoid making it too heavy, before adding any additional flour let it rise in a buttered bowl for an hour. If it is still too sticky at that point, you can add just a little more flour then. But most likely the dough will be much easier to handle after rising. Turn out on a floured board-- or if you're using a Kitchenaid, continue to knead using the dough hook. Knead until the dough feels smooth, pliable and elastic. You may need to add up to one cup more flour if necessary to get the right feel. Shape the dough into a ball, put into a well-buttered bowl, and turn to coat on all sides. Cover and let rise in a warm, draft-free place until doubled in bulk, 1 to 1 1/2 hours. Punch the dough down. Knead for 2 or 3 minutes and shape into two loaves. Thoroughly butter two 8 x 4 x 2-inch tins. Place the dough in the tins, cover, and let rise in a warm place until almost doubled in bulk. Preheat oven to 375 degrees, place the bread in the center of the lowest rack, and bake for about 45 to 50 minutes, until the loaves sound hollow when tapped on top and bottom with the knuckles. Remove the loaves to a rack to cool. If you want a very soft top crust, brush the loaves with melted butter when you bring them out of the oven. I would love to see a photo of this. I am going to try this recipe, with a twist. I am going to try making it with my gluten-free all-purpose flour blend. One thing I really miss is a sandwich type bread that actually looks like a sandwich type bread and doesn’t cost $6 for a 3/4 lb loaf. I have all the ingredients on hand right now, no kids at home tomorrow, I am going to go for it! I will let you know how it turns out. Fingers crossed! Well, today I spent a good 4.5 hours on this project starting with making the oatmeal. I used my GF certified steel cut oats because one of the problems with GF products is that meeting daily fiber goals can be difficult. I used my all-purpose GF flour mix which was a blend of white rice flour, tapioca flour, and potato starch with xanthum gum. I made the recipe just like yours otherwise. It.did.not.rise. Well, it did a bit but not double in size. I punched it down, warmed the oven a bit, then placed it in for another rise. Nope. Punched it down, kneaded it, and put it in the pans to rise for 30 minutes. Then into the oven for 50 minutes. When I took it out it sounded hollow when thumped. When I cut into it, it was very dense and chewy. But it tasted OK. It just wasn’t the beautiful sandwich bread I wanted. It was good toasted with butter. It did have a crunchy crust which I like. Good luck with more experimenting. Kimberlie, teff flour is not gluten free, just FYI. also, next time just let your bread sit for 2-3 hours, do not punch down, let it sit and rise in a oiled bread pan, the carefully transfer to 400′ oven, bake 10-20 minutes, then lower the heat to 350-375 and let finish baking. When done, let rest on it’s side in the bread pan, and remove as soon as cool enough. Also, I did not note it, but adding a 1/2 tsp or so of baking soda can help with leavening. Hope that helps, and just keep trying!!! I am planning to try this recipe tomorrow, will let you know how it comes out, sounds great!! Yum! I’ve been doing this for a while- I threw in the leftovers on a whim one morning, and just add a bit of flour at the end till it’s how I like it. VERY good!! I love adding in leftover grains- I do it all the time. I have used leftover cooked oatmeal, brown rice, cooked whole wheat grains, etc. One time I made cocunut sticky rice for dinner and used the leftovers in bread the next day. The texture tends to be soft and smooth and almost luxurious. Yummm. This looks delicious!! I’ll have to try it soon. I’m new to bread making but have been making the cooks illustrated multigrain bread which starts with soaked 7 grain hot cereal. We’ve loved it so much I haven’t even tried another! of a young family of 5 in Oregon. Thank you! I don’t have luck mixing bread either, but I have gone to ALWAYS using my bread machine to mix the dough and do the 1st rise, then I shape it how I want and bake it in the oven. Almost foolproof that way. I just made a bread with oatmeal and some maple syrup and chopped walnuts in it. It wasn’t so sweet that you’d call it breakfast bread though. It was wonderfully! I’ve heard that sprouted grains are healthier for you. Like bean sprouts – whatever is in that sprout part isn’t in the seed part. Hi – I’ve loved your blog for years now… thank you for everything! I’ve noticed recently in my Google Reader that your full posts no longer come up… did you change that setting recently? It only lets me read the first few lines of your blog post now and I have to actually go to your blog to read the “full post”. And when I do, it takes waaaay too long for your site to load up the photos, so I actually usually just give up waiting so I’ll probably just have to (sadly!) unsubscribe. I hate to be a pain, but can you change this back? I don’t know all the ins and outs of blogging so sorry if my request is lame or seems dumb. Maybe there’s something I did on my end that messed it up!